Say the word “stress” these days and nobody even reacts, they simply nod their head. We wake up with stress, go to bed with stress, in fact if you didn’t know better, you’d think everyone was dating someone by the name of Stress. What bothers me though, as if daily stress isn’t bad enough, is that lately I’ve had so many conversations among friends and even strangers, about food causing stress. Now, I don’t mean food causing stress as in “eating too many carrots causes stress”, but as in people becoming stressed about food. Are they eating the right food? The wrong food? About growing, purchasing and preparation. About transitioning their diet to a healthier one. It really seems like food is stressing people out and that bothers me. Food should not stress anyone out! Food is our sustenance, its what nourishes us, keeps us going. Food should not bring you down. While I do think that eating healthy food is always a good idea, it shouldn’t feel like a chore. I have to say though, when I first transitioned to clean eating, I found it challenging for a couple of reasons. The first reason is not because my house was loaded with junk food (although there was more than I would have liked) but because I knew I needed to take a look at all the food I had in the house to see what was “okay to eat” and what wasn’t. The second reason I found the clean eating transition a challenge is because once I started reading labels, I realized that the majority of food on the store shelves is packed with high fructose corn syrup, sugar or chemicals and so few products are “clean”. However, that said, once I found the “clean” brands, I simply began looking for those in each section. So if you’re looking to change your kitchen over to a clean eating kitchen, I thought I’d share how I made the transition work for me. Organic food. Since a large portion of clean eating is eating fresh fruits and veggies, minimizing your exposure to pesticides on produce is really important. Thankfully I was introduced to organic food, it’s certification standards and growing practices when I worked for an organic certification agency in the mid 1990’s, so I had already been buying as much organic produce as possible. The same went for milk, eggs and dairy. But if you’re new to purchasing organic food and not sure where to start or want to get the best value for your dollar, I would recommend a few things to ease into it. Buy organic for the foods you eat the most, conventional for the foods you eat less frequently. This may sound backwards to some, but the key is to remember that this is about your health and exposure to pesticides, hormones and other not so healthy chemicals, so focus on limiting your exposure. Not sure whether what you’re eating is organic or not? There are labeling laws. Food can only be labeled and sold as “organic” if they fall under specific guidelines. If it’s not labeled “organic”, it’s not. Stash the EWG’s Shopper’s Guide to Pesticides in Produce Dirty Dozen and Clean 15 lists in your pocket to help you decide which items produce to buy organic and which items you can continue to buy conventional. Use the same EWG lists (Dirty Dozen and Clean 15) to buy frozen and packaged foods (i.e. – organic apple sauce and organic apple juice, but conventional frozen corn, dried pineapple and guacamole). Back to my house. Prior to clean eating, my pantry contained a hodgepodge of packaged foods, some good, some not so good. I found the easiest thing for me was to go though one type of food at a time. Part of clean eating is eliminating sugar, white flour and processed foods. I started with pastas; I had some white pasta, some whole grain. I really like pasta, so I decided all the white pastas would have to go or I would be tempted to eat them. With the exception of open packages, I gave all the white pastas to a friend. Now I only buy whole wheat/whole grain pasta, brown rice pasta, etc. unless what I’m looking for isn’t available in whole grain. Cereal, we eat that on a fairly regular basis in our house so that was next to be “cleaned”. We typically don’t keep sugared cereals on hand, but if you do, one way to transition away from sugared cereal to clean cereal is to move from cereals sweetened by high fructose corn syrup or sugar, to those sweetened by honey or other natural sweeteners (listed above). After you and your family have gotten used to those, then try to ease your way down to unsweetened or as near as possible. My son loves puffed corn cereal. Honestly I think it’s a bit bland, but he loves it because he says it’s like eating popcorn for breakfast. You won’t find me arguing with that! Onto bread. I love bread! Other than an occasional crusty baguette or loaf of sour dough, we typically eat whole wheat or whole grain bread. But imagine my surprise when upon reading the label, I found the bread we had been eating was loaded with high fructose corn syrup. I can’t even begin to describe how ticked I was. My next trip to the store I found a cleaner bread without high fructose corn syrup (and all the other lovely stuff that was with it) and that new bread has now become “our bread”. I continued the “cleaning” process through the kitchen, fridge, freezer and pantry, but did it in phases. I recommend doing the same to keep yourself sane. The things that we had already opened, I made a mental note to check into when they were used up and then put the desired replacement on the grocery list. For example, instead of “ketchup” I put “org. (organic) ketchup w/o HFC (no sugar or naturally sweetened)” on the list and “chocolate chips with 60%+ cocoa, sweetened with grain or evaporated cane juice”. Now I know this probably sounds crazy, but my goal was to shop once for this item and have this replacement become “our ketchup” or “our chocolate chips”. Once I know who made them, it made restocking the pantry easy. Now it’s as simple as “chocolate chips (x brand)”. I don’t have to think about it any more. Hopefully, if you find yourself among the food stressed folks, this will help ease the stress a little. If there’s something I missed, by all means let me know! Take care and enjoy your food. Over the past few years, as I’ve made my journey with clean eating, we’ve had an interesting relationship. At times it was strong, the food and recipes were totally inspiring and fulfilling and at other times, not so much. One of the biggest challenges for me has always been sweets. I have a ridiculous sweet tooth. Some of the things I’ve eaten in my lifetime would probably make some people sick just thinking about it. As a kid I remember climbing onto the counter and getting into the cupboard where my Mom stored the little jars of sprinkles, red hots and other candies for decorating cakes and cookies, I would analyze the stash, sneak an amount that I thought she wouldn’t notice and pop them in my mouth. The same went for bags of chocolate chips, marshmallows and canned frosting: chocolate chips by the handful, marshmallows by the mouthful and frosting by the fingerful. Oh, and marshmallow creme by the spoonful. And while sweets in pretty much any form were a turn-on, my favorite has always been chocolate chip cookies. Mmm…hot, gooey, chocolate nearly dripping from a cookie hot out of the oven… Yum! Unless, of course, my Mom got the bright idea to put nuts in the cookies. Total buzz-kill. My Mom was actually pretty good about keeping uncontaminated chocolate chip cookies around and for the most part I wasn’t obsessive about them. If I wanted one I would ask and that would cover the craving. On occasion I would ask for a second one (or simply sneak another if I thought my parents would say “no” to the request), but that wasn’t too often. However, on one occasion, I got up in the middle of the night (sleep walking) and dipped into the cookie jar. Apparently, I enjoyed a few cookies before my parents found me and put me back to bed. The next day, when they told me what I had done, I was alarmed. Not only had I just found out that I’ve been sleepwalking, but I also realized I’d eaten multiple cookies and didn’t even recall enjoying them. What a waste! And so the journey continued. When I started clean eating a few years ago, sugar was by far the hardest thing for me to ditch. Part of the problem is simply my sweet tooth, the other part is that sugar is in nearly everything we eat… even places I didn’t suspect it like pizza sauce, pasta sauce, savory dishes. When I learned to read labels, I realized why so many people have such a bad relationship with food. Most of the foods we eat are laced with sugar and other stuff we shouldn’t eat. That’s also when I realized the only way to control what was going into my body was to make it myself. The good news is, thanks to the many clean eating gurus, I’ve found replacements to traditional sugar: honey, pure maple syrup, agave nectar, evaporated cane juice (a.k.a. Sucanat), etc. and the best part is that they taste good, fulfill the sweet craving, but I don’t get that addictive need for more like I do with sugar. And now we come to the subject of this post: Chocolate Chip Oatmeal Cookies. While I’ve found many tasty recipes for breakfasts, lunch, dinner and snacks, most of the desserts were not really doing it for me. I still had the nostalgic craving for chocolate chip cookies, cakes, frostings, etc. And while I could live without some of the other things, I still yearned for healthy sweets. In my mind I thought it was an oxymoron, but at the same time thought someone had to have done it, and if they hadn’t, I was going to start experimenting. Thankfully, it didn’t come to that. A few weeks ago, while cruising one of the local Co-ops with a friend of mine, we ran across a sale rack of recipe books. 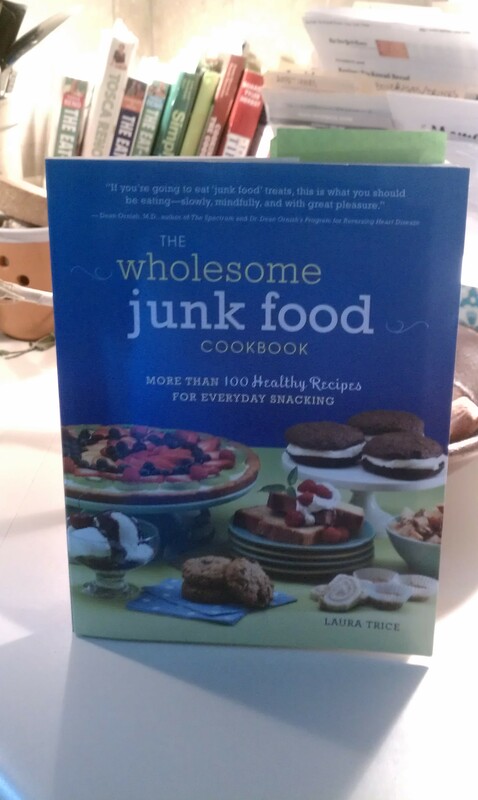 One in particular caught my eye, The Wholesome Junk Food Cookbook by Dr. Laura Trice, M.D. When I first spotted it, I thought it was too good to be true. Then I started flipping through the recipes and reading the first chapter. I couldn’t contain my excitement, “I have to get this! This is it! This is what I’ve been looking for!” There are recipes for ice cream, frosting, cakes, and even chocolate chip cookies! And the best part? The recipes actually look good. So I bought it. The first recipe I made was the barbeque sauce… holy yumminess! And now, a couple of days ago I made the chocolate chip cookies. Now, I have to be honest, while mixing them up, I had my doubts. And because I’ve always been pretty finicky about my chocolate chip cookies I was afraid I wouldn’t love them. But when they were baking up they smelled… like chocolate chip cookies. And when they came out of the oven, I tried one. Mmm… They were as she had promised in the book. Wonderful! But the true test had not yet taken place. My son. While he’s not a picky eater at all, I was still a little worried he’s snub the cookies. Instead, he loved them! So if I’ve got you craving cookies, head to The Wholesome Junk Food Cookbook website and there you will find some sample recipes, including Chocolate Chip Oatmeal Cookies, Chocolate Fudge Sauce and Golden-Pineapple Carrot Muffins. So there you have it, for those of you who have been with me on the search for healthy junk food, you can now have your cake and ice cream and cookies and eat them too!